You will book your international ticket into and out of Denpasar (airport code: DPS). If you wish to arrive a day early to settle in and get acclimated I can request additional nights at our group hotel. Please contact me directly for rates. Yes, private airport transfers are included in the price of your trip. Whenever you arrive, day or night you will be met by a private driver and transported to the group hotel. Note: If you arrive early and decide to stay at an alternate location other than our group hotel, you will be responsible for coordinating and paying for your own transportation directly with the hotel where you will be staying. Cocooned amongst rice paddies and coconut palms, The Shala Bali is a place of peace, wellness and connection to nature. 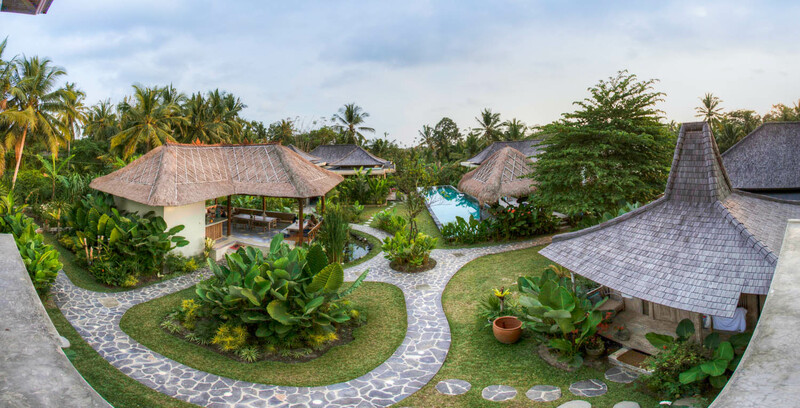 Nestled in the spiritual center of the island, rooms are spacious and breezy and decorated in a Balinese chic style. Each Villa boasts its own varying views of lush rice fields, tropical gardens and jungle vistas. Luxurious bathroom amenities will entice you to refresh and rejuvenate practices. Sink in to this slice of paradise for the week. Note: The rooms at The Shala are open air style and do not have air-conditioning. All rooms are equipped with fans and windows that can be opened for ventilation. Yes, 3 delicious vegetarian meals are included daily. The Shala Bali Cafe offers tasty, healthy vegetarian food, all with vegan options. They offer a range of organic spelt, sourdough and gluten free breads baked in house as well as an eclectic menu of dishes from around the world. Sourcing the best organic produce, the Shala creates changing menus of scrumptious dishes, savory and sweet, alive with color and flavor. Gratuities are not included in the price of your trip. Service charge is included in all restaurants-bars etc, however if you receive exceptional service by staff, housekeeping or other employees helping you throughout the week then an additional tip is always appreciated. I suggest a budget of around $5-$10/day per guest. A non-refundable & non-transferable of $500 deposit is required to hold your space. Final Balance Policy: Final payment must be received by June 15, 2019 in order to be eligible for the early bird pricing, and all payments are non-refundable. If you cancel prior to June 15, 2019 I will refund your payment minus the non-refundable deposit. All payments are non-refundable & non-transferable after June 15, 2019. I must strictly adhere to this cancellation policy to offset costs incurred prior to the commencement of retreat. Click here to view the Terms and Conditions to which you agree upon registration. ​If the participant arrives late to retreat or leaves prior to its conclusion, refunds will not be made for any unused portion of the retreat. No refunds will be made for meals, yoga classes or other activities that the participant misses or decides not to participate in for any reason. No, if you are planning to stay in Indonesia for under 30 days, the Visa on arrival is free and also the departure tax is waived. If you plan to stay longer then 30 days, you will need to obtain a Visa before leaving the US. For more information on this please visit the Embassy of Indonesia website. IMPORTANT: If your passport expires within six months of your arrival date to Indonesia, please be sure to renew your passport before you go to avoid any issues at immigration. There are no exceptions. There are no required vaccinations for travel to Bali. However, there are some recommended (suggested) vaccinations given by the CDC. To see the complete list of what is recommended please visit the CDC Website and consult with your primary care physician to make a decision on what is best for you.